When I was young (9, 10, 11 – somewhere around there) I remember someone telling me that if you swallowed too many hairs, they would eventually clog up your throat and you would choke on those hairs and die. I imagine it was my older brother who told me this (thus the picture. 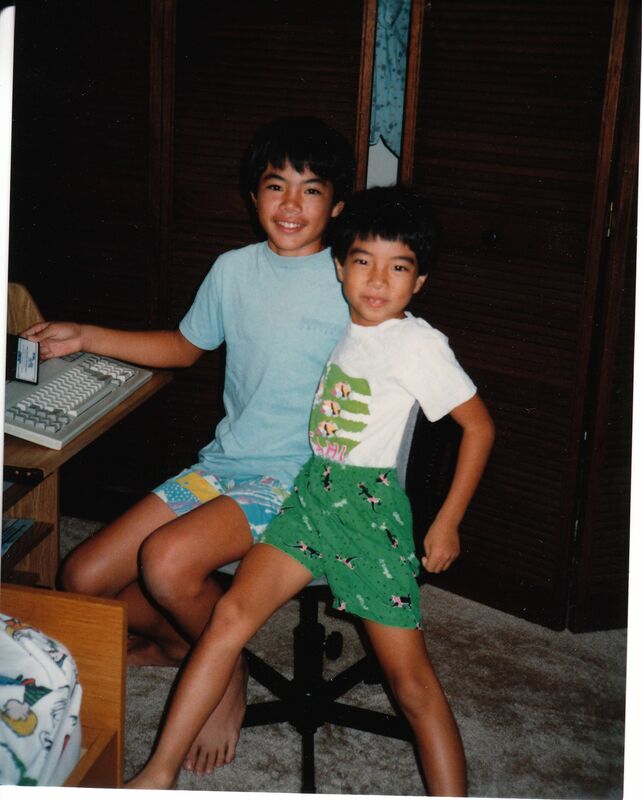 Notice the JAMS shorts), or maybe one of my older cousins, or a good friend- but regardless, I believed it to be true. I was afraid of death and choking on hairs seemed like a crappy way to go. For the next month or so, I developed a terrible spitting habit. Every time I felt or even thought I felt a hair in my mouth, I had to spit. I became a spitting machine- not so much that I was good at it but that I couldn’t stop. The thought of death by choking on hair was too much to bare. All I know is that one day, it occurred to me that others were not afraid of dying by swallowing hair. No one else at school was spitting as much as I was. And to be honest, I think I might have forgotten the reason for it all together (one of those rare moments to be thankful for a short attention span). Call me gullible, but there is something powerful, dangerous, and very relative about this story from my past. Recently, some great friends shared with Michelle and I the video below entitled “The Danger of a Single Story,” a TED talk by Chimamanda Adichie. After watching the talk, I was reminded that we often operate from closed-minded frameworks. A child might believe that they can die from swallowing hairs or that swallowing a watermelon seed causes a watermelon to grow in one’s stomach. But even in college, I was faced with “The Danger of a Single Story”. It had only been about a month or so into my first semester as college freshmen. I was struggling to adjust to a new life away from family, friends, and pretty much all things that were familiar to me (Tacoma, WA is very different then Honolulu, HI). One night I made instant curry in my dorm room and used chopsticks to eat my comfort food. A classmate that lived on the floor walked by my room, stopped to check out what I was doing, and decided to engage in conversation. Unfamiliar with curry, he tried to take the conversation in another direction. I was instantly bothered by this statement. There is no right or wrong in this story. Matt was just trying to strike up conversation, but from his perspective, from what he knew about Asian culture, apparently all Asians use chopsticks to eat. I was bothered for a couple of reasons. One, I actually truly believe that the spoon is the best and most useful utensil of all (which I didn’t have with me at the time, I only had chopsticks); and two, at the time, I never really viewed myself as Asian (only in college did I start to get a sense that my race and ethnicity mattered). Could a world exist for Matt where someone who is Asian doesn’t know what chopsticks are? Furthermore, in regards to my response back to him, does using chopsticks make you Asian? Of course I have used similar logic that Matt used. I confess: I believed that people living in Alaska lived with snow 24/7/365 and yes, that they lived in igloos. (I grew up on an island and had never seen snow before). I use to believe that you could not be Christian and drink beer. ( One of my favorite Christian authors writes about the great conversations he has with friends about his faith over pints.) I believed in the American Dream: to make enough money to retire, raise 2.5 children, and not live in debt (only to realize that there are other things to live for). Call me naive, but there are too many examples of how we all operate from particular frame-works where we don’t know much about what we are talking about. There are too many ways where we can get trapped in a single way of thinking or living and not see things from other perspectives. “When I was a child, I talked like a child, I thought like a child, I reasoned like a child. When I became a man, I put the ways of childhood behind me.” 1 Corinthians 13:11. I can continue to believe that swallowing hair might kill me, or I can grow-up, realize the foolishness and dangers from believing in a single story and live my life to it’s fullest potential. I don’t think it was me….though it’s entirely plausible, if not even quite likely. Nice Jams. I awoke at 3:11 AM (I’m big on time and numbers) and the memory of when I ALMOST DIED (lol) choking on a single hair came to my mind. So, yup I “Googled” it. Found your story. Inspirational. I MYSELF have choked on a SINGLE strand of hair, tried my best to pull it out at first quickly before realizing it had wrapped around that dangly part, cringed with disgust and tried not to vomit as I did my best to stay calm. Believe me, I THOUGHT I’D DIE from the anxiety or a heart attack. I had to cut the strand, can’t remember if with my hands or teeth but it stayed there till eventually I swallowed it. Occasionally the thought still comes to mind but I had MANY sleepless nights dwelling over this. 1 Corinthians 13:11 is the reminder I needed to “LIVE”, after all I did not die it just made me stronger! I worry too much about what could go wrong I bleak out what’s going right in my life. Growing up for me has not been easy. Thanks for your story! God bless.